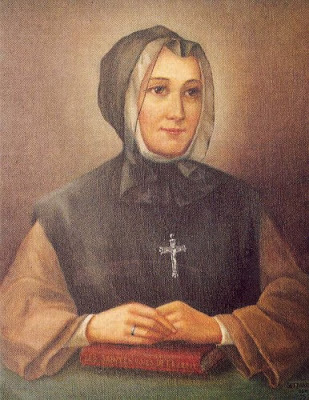 Today we have a first here at the Guide as we meet Marie Marguerite d'Youville, woman who overcame personal hardships to found a religious order. More than two centuries after her death she became the first Canadian to be canonised, making her our very first saint here at Gin Lane. Marguerite was born to Marie-Renée Gaultier de Varennes and Christophe du Frost, who died when she was still very young. Although the family were desperately poor, Marguerite's grandfather arranged for her to undertake education at the Ursuline convent in Quebec City, where she remained for two years. When she returned home, she educated her siblings and becomes an invaluable help to her mother. A vibrant, intelligent girl, Marguerite was just a teenager when her widowed mother married an apparently reprobate Irish doctor, Timothy Sullivan, effectively sabotaging her daughter's hopes of making a good marriage. At the age of 21 Marguerite married a reprobate of her own in the shape of bootlegger François d'Youville, with whom she would have six children, two of whom survived infancy. François died less than a decade after the marriage but the years in which they were together proved difficult for Marguerite, with her husband away for long periods and engaged in highly illegal liquor trades. Unhappy and beleaguered, Marguerite turned to her religion to help her deal with the many losses she endured and when her two surviving children entered the priesthood, Marguerite's charitable works went one step further. In 1737 she, along with three fellow charitable ladies, founded a religious home for the poor in Montreal with the intention of offering food, shelter and support to those at their lowest ebb. Mocked by family, friends and society for their lofty ideals, the women were nicknamed les grises, or, the grey [drunken] women in reference to Marguerite's scandalous late husband. They refused to be cowed by their critics and the movement grew, helping more and more of the poorest people on Montreal. Eventually becoming known as the Grey Nuns, the association rebuilt the General Hospital of Montreal and opened charitable homes in other cities across Canada, silencing those critics who had thought the women were certain to fail. Marguerite died in the hospital her foundation had restored. In 1990 she was canonised, with a feast day of 16th October; not a bad end for the girl who endured poverty, unhappiness and disdain!